Belarusian experts Jaŭhien Prejhierman and Piotr Piatroŭski opine that a pause in Eurasian integration is necessary until the members resolve current controversies. The government announces the date and details of the 2018 local elections. The Defence Ministry brings changes to the Piečy training centre after an outrageous hazing incident. The first Belarusian Nuclear Power Plant, Astraviec, successfully passes its stress test. Belarus improves its anti-corruption record. Officials and cultural figures discuss policies to raise the status of the Belarusian language. The experts call for a pause in Eurasian integration. Narodnaja Hazieta, a newspaper, provides the opinions of Belarusian experts Jaŭhien Prejhierman and Piotr Piatroŭski on the state of the Russia-led Eurasian Economic Union (EEU). In just a few years, the EEU overcame several development stages that took the EU several decades: a customs union, a single economic space and an economic union. However, the result is that none of these platforms operate properly. Each contains numerous barriers, exceptions and limitations. Member states do not fully implement agreements. Deadlines for eliminating exemptions from the single market are continually postponed, including oil and gas prices, which are particularly sensitive for Belarus. This simply contradicts the spirit of the alliance and violates the interests of the participating states. Instead of bringing member states together, it increases strategic uncertainty and vulnerability. Therefore, if the countries really want to build a strong mutually beneficial union, there must be a respite from further integration. It is for this reason that Belarus has proposed a moratorium on any new decisions in the EEU until the implementation of previously reached agreements. Elections to local councils will be held on 18 February 2018. 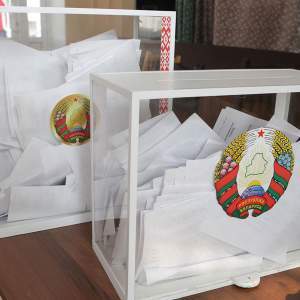 The state plans to allocate about $10.5m for election funding, but Belarusian President Alexander Lukashenka has urged the authorities to save rubles anywhere possible, writes Belarus Segodnia, a daily newspaper. The Chairman of the Central Commission for Elections and Republican Referendums, Lidzija Jarmošyna, announced the government has no obligation to invite international observers to elections to local councils. Nevertheless, the President underlines the special role of observation and offers a possibility for short-term observation to all foreign diplomats accredited in the Republic of Belarus. Organisations that interact with international structures in the field of local self-government are allowed to invite experts and observers from partner organisations, too. Jarmošyna also said that since business plays an essential role in the life of our country, it should be well represented within local councils. The Defence Ministry has instituted major changes at the Piečy training centre after a brutal hazing incident allegedly led to the death of private Aliaksandr Koržyč. It ordered the replacement of the junior command staff and sent 20 sergeants from the 3rd and 307th schools to other military units. Uladzimir Makaraŭ, the press secretary for the Defence Ministry’s Ideology Directorate, assured the public that the transfers will not spread hazing practices. Those who carried out and were involved in the hazing activities are already under investigation. After the death of the soldier, the Investigations Committee (equivalent to the FBI in the United States) opened 15 criminal cases against officers stationed at the Piečy training centre. New (left) vs old (right) uniform. Photo: sb.byThe Belarusian army changes its uniform. The reform aims to make the uniform more lightweight and practical. Many servicemen will be able don new winter garb in a month. The traditional Soviet hat with ear-flaps known to many generations will be dismissed and replaced with a crocheted hat. The jacket collar will turn from fur to fleece, which is cheaper and several times lighter. The costly black leather belts will be replaced with protective colour textile belts. In total, the new uniform is lighter by a third. Recent research by the Defence Ministry has shown that lighter and higher quality materials make soldiers more capable. 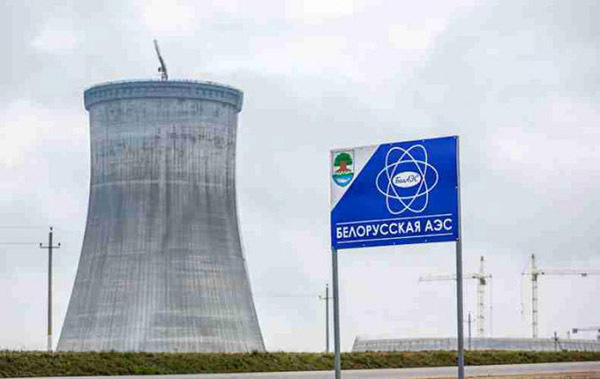 The Belarusian Astraviec nuclear power plant (NPP) successfully passed its stress test. The Emergency Ministry’s Nuclear and Radiation Safety Department has published a national report on the results of a series of stress tests for Astraviec plant, reports Zviazda, a state-owned daily newspaper. The tests checked the resistance of the NPP to threatening phenomena that can hypothetically happen in Belarus: strong winds and squalls, tornadoes, large hail stones, dust storms, strong blizzards, ice, fog, drought, as well as combinations of these phenomena. According to Department Head Volha Luhoŭskaja, the NPP at Astraviec is resistant to emergency situations similar to Fukushima. The NPP, which is constructed to the latest generation Russian ‘3+ design,” fully meets the highest international safety standards. Belarusian specialists have already submitted the report to the European Group for the Supervision of Nuclear Safety and the European Commission for international review. Belarus improves its anti-corruption record. An interdepartmental conference at the Academy of Public Administration discussed anti-corruption law application and its further improvement in Belarus. Transparency International states that in the corruption perception index, Belarus rose from 107th place to 79th in 2016. A survey of Belarusian economists conducted among small and medium-sized businesses shows that the actual rating of the country is much higher and is at the level of Poland, Lithuania and Slovenia. 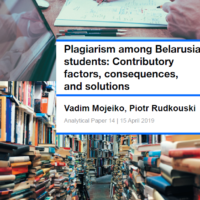 One newspaper claimed that international experts regard Belarusian anti-corruption legislation as some of the most progressive and effective in the world. Prosecutor General Aliaksandr Kaniuk pointed out that the country is currently implementing policies that minimise corruption: limiting state interference in business, easing firefighting, sanitary, environmental and other requirements, abolishing administrative checks, simplifying procedures for obtaining certificates, approvals, and other permits. Can the Belarusian language play a greater role in society? On 11 November, Belarus Segodnia held a roundtable on the Belarusian language, featuring both pro-governmental figures dealing with the language policy (MP Ihar Marzaliuk, ideologist Vadzim Hihin, Iryna Bulaŭkina from the Ministry of Education) and nationalists from the opposition (artist Mikola Kupava and historian Lieanid Lyč). The participants agreed that the vast majority of Belarusians want to live in an independent country, and no Belarusian nation and statehood is possible without the Belarusian language, history and cultural heritage. The opposition speakers claimed that the role of the Belarusian language can be improved only through its wider use at the highest levels of education. Officials responded that forced Belarusianisation will lead to its rejection by the citizens, and therefore soft methods should be used in this process. In October, the European Union formally invited Belarusian President Alexander Lukashenka to attend the Eastern Partnership Summit in Brussels on 24 November. However, up until now, Belarus-Europe contacts remain scarce even at the ministerial level. Romania’s Teodor Meleșcanu has been the first EU foreign minister to visit Minsk since mid-July. In recent weeks, Belarus’s foreign ministry continued to build bridges with Europe, mostly through the mechanisms of joint trade commissions and parliamentary diplomacy. Meanwhile, Alexander Lukashenka reaffirmed the importance of close personal relationships, meeting with his autocratic friends from Venezuela, Uzbekistan and the UAE. However, doubts remain about the ultimate efficiency of his efforts. On 9–10 November, Romania’s foreign minister Teodor Meleșcanu paid an official visit to Belarus. He held talks with his Belarusian counterpart Vladimir Makei and met with Prime Minister Andrei Kabiakou. The visit ended a nearly four-month-long hiatus of EU foreign ministers’ trips to Minsk. The foreign ministers of Belarus and Romania discussed a wide range of bilateral issues and prospects for cooperation between Belarus and the European Union. Both sides agreed that Romania has played an important role in strengthening the upward trend in Belarus–EU relations in recent years. Kabiakou and Meleșcanu talked about possible cooperation in IT, healthcare and agriculture, as well as joint manufacturing of auto components, furniture, clothing, textiles, and building materials in Belarus. The head of the Belarusian government actively “sold” Belarus’s role as a launchpad into the Eurasian Economic Union markets (full members include Russia, Belarus, Kazakhstan, Kyrgyzstan, and Armenia) to the Romanian diplomat. Trade turnover between Belarus and Romania fell steadily from 2012 to 2015. The two countries reversed this negative trend last year. In January–August 2017, goods exchanged grew by a respectable 25 per cent with the balance in favour of Belarus. Teodor Meleșcanu, who is also a Romanian senator, met with the heads of both chambers of the Belarusian parliament, Mikhail Miasnikovich and Uladzimir Andrejchanka. The minister assured them of “[Romania’s] intention to develop relations with Belarusian MPs.” In fact, the two parliaments have already exchanged visits at the working level, once in April 2016 and then again this November. In late September, two Belgian MPs, both members of a Flemish nationalist party, visited Minsk as representatives of the Inter-Parliamentary Union (IPU), an organisation that works to promote democracy and inter-parliamentary dialogue. They had meetings in the Belarusian parliament and at the foreign ministry. Interestingly, Belarusian government media reported the name of only one visiting MP, Yoleen Van Camp, and never mentioned her companion, Senator Pol Van den Driessche, president of Belgium’s group in the IPU. Perhaps, the silence can be explained by the fact that, in his home country, the senator was a target of numerous accusations of sexual harassment. On 30–31 September, two Belarusian MPs visited Tallinn at the invitation of the Rijgikogu, the Estonian parliament. There, they met with Een Eesmaa, the vice-speaker of the parliament. Jüri Ratas, Prime-Minister of Estonia, received the delegation and gave them a tour of his official residence. The Belarusian foreign ministry has been investing a lot of effort in the legitimisation of the Belarusian legislature. On 26 October, Belarusian Deputy Foreign Minister Andrei Dapkiunas spoke at a workshop held in the Belarusian parliament, which focused on pressing issues of foreign policy and trade. The heads of parliamentary working groups on cooperation with foreign parliaments were the target audience of this event. Rich enough to help out an old friend? President Lukashenka received his Venezuelan counterpart Nicolas Maduro on 5 October. The Bolivarian leader made a stopover in Minsk en route from Moscow to Ankara, looking for economic and geopolitical support wherever he can get it. Relations between Belarus and Venezuela reached their peak in the last years of Hugo Chavez’s rule. Exorbitant oil prices ensured the well-being of the Venezuelan economy. Belarus launched several major construction and joint manufacturing projects in Venezuela. In 2010, the Belarusian exports to this country surpassed $300m. Bilateral trade has been in free-fall since 2013, plummeting to a rather dismal $2m for 2016. Most joint projects were suspended or shut down. Venezuela owes $113m to a Belarusian construction company. However, for political reasons, despite debts some construction projects are still underway. During his meeting with Lukashenka, Maduro claimed the moment was right for relaunching joint projects. He called for renewing agreements in the field of industry and agriculture. Maduro wants his Belarusian friends to believe that Venezuela is now “at a good point for economic recovery and growth.” However, some experts claim that the country is heading to bankruptcy. 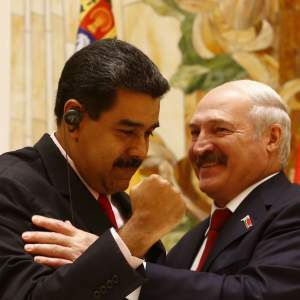 Lukashenka predictably pledged that “Venezuelans can always count on the support of friendly Belarus.” Officials of the two countries will soon meet to draw a plan of specific measures to restore economic relations. However, Belarus hardly intends resuming the implementation of joint projects and massive deliveries of goods to sisterly Venezuela without upfront payments or sound financial guarantees. 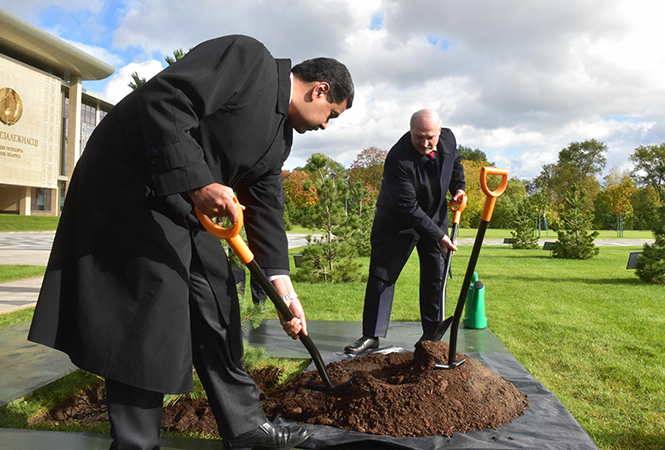 Alexander Lukashenka spent two weeks, from 25 October to 6 November, in the United Arab Emirates. Lukashenka’s press service announced his “working visit” to this Middle Eastern monarchy. They also reported the President’s intention to stay as a guest there “for a couple of days” at the invitation of his Emirati hosts. The only working element of the Belarusian leader’s visit to the UAE was a short meeting with Abu Dhabi’s Crown Prince Sheikh Mohammed bin Zayed. 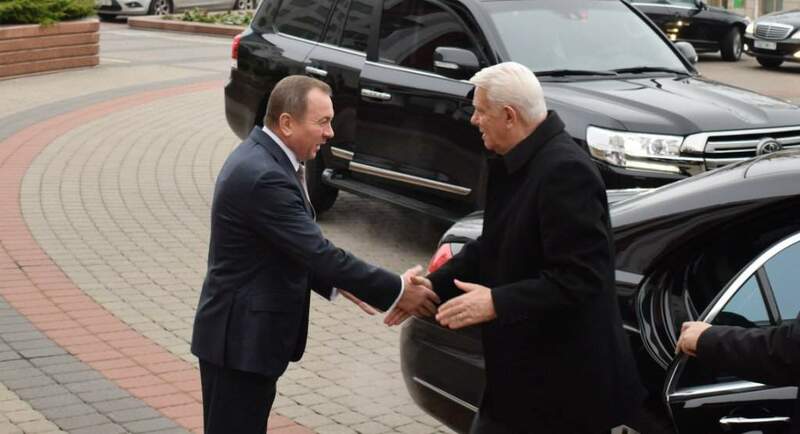 Viktor Lukashenka, the President’s eldest son and his national security adviser, accompanied his father to this meeting—a clear sign that arms sales remained among priority topics under discussion. Despite Lukashenka’s efforts to boost economic cooperation with this rich Arab country, trade figures remain modest. The turnover between Belarus and the UAE attained $29.7m in 2015 and $37.9m in 2016—a far cry from the target figure of $500m set three years ago. It is true that turnover reached a new high in January–August 2017, increasing by a factor of 2.8 times. However, this spectacular result is due chiefly to $20m delivery of BelAZ trucks to the UAE. During his “working holiday” in the Emirates, Lukashenka also met Ukrainian President Petro Poroshenko, who happened to be making a working visit to the country. The Belarusian leader might take lessons from Poroshenko on how to build successful relations with Middle Eastern regimes. Ukraine’s trade with the UAE in 2016 was nine times greater than Belarus’s, reaching $341m. The Ukrainian leader also secured a deal on a visa-free regime between the two countries. Belarus’s willingness to work pragmatically with any international partner has failed to produce noticeable economic benefits. These efforts need to be supplemented by the resolute modernisation of the national economy. Modernisation remains very difficult without full normalisation of relations with the West, which, in its turn, is impossible without serious democratisation efforts.